Originating from humble beginnings, Benchmark takes the same energy and dedication that made the company a success and applies it to your business’s growth. Offering a free full service email marketing list for anyone looking to contact 2,000 people or less, Benchmark does its best to live up to this goal. Even premium packages are reasonably priced, meaning that you won’t get punished for your success. With easy-to-navigate email creation, including tons of beautiful templates, Benchmark could be your ticket to taking your company to the next level of professionalism and profitability. Benchmark makes organizing and importing your email contacts incredibly easy, perfect for first timers. If you have a list of your contacts already available, you can easily upload your contacts all at once with a few clicks from CSV, XLS or TXT files. 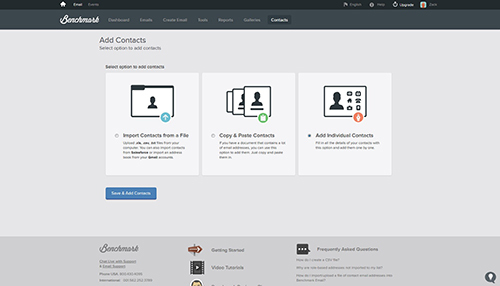 You can also copy and paste contacts from any document, which is convenient for people who are pasting from Excel or similar products. You can also use one of the service’s signup forms to let people add themselves directly to your contact list. Separating users into groups is extremely easy. For instance, adding members to your unsubscribe list is as easy as checking their names and clicking a couple buttons. If your email winds up in a user’s spam folder, Benchmark will automatically move this person to your unsubscribe list. You can also add all sorts of member information, ranging from personal info to more sophisticated info. For example, you could find out your average subscriber’s age to attempt to reach this group more effectively. Setting up your list is only half the battle of launching a successful email marketing campaign. You’ll need to know how well your tactics are working to decide how you want to proceed. 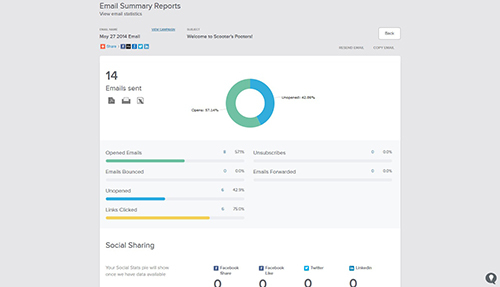 With readily accessible campaign reports from Benchmark, you can see exactly how your subscribers respond to your emails. This includes actions like opening and forwarding your email, and also who has clicked on a link in your email, which allows you to see what kinds of people you’re reaching. You can easily implement Google Analytics in your emails to see from which emails your customers are coming from. This can help you see which of your emails are working best and how you could improve the ones that aren’t working as well. Implementing autoresponders with Benchmark is as easy as 1,2,3. All you have to do is choose which list you want to automatically send emails to, and then choose its trigger. For example, when someone subscribes to your list, you can automatically send them a welcome email. With the autoresponder implemented, you can even wish every customer a happy birthday without having to do a thing. With Benchmark, you have a wide variety of email editing tools to match your style and your ability. The easiest interface is the drag-and-drop interface, offering easy-to-use picture, color and text editing to let you customize your email without any hassle. There are also more advanced options: a HTML editor, a text-only editor and a traditional email editor. 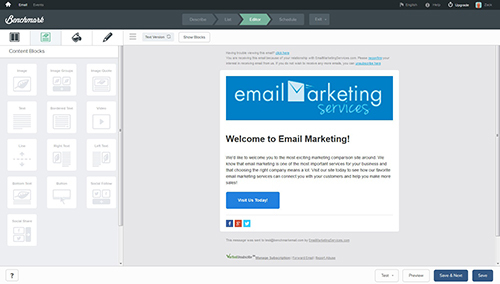 Benchmark offers you tons of options to design your emails that speak to you and your customers. To help you reach as many subscribers on your list as possible, Benchmark sends all emails as MIME type so that email service providers won’t classify them as spam. Other anti-spam features help ensure that your emails will arrive in your clients’ inboxes and not the spam folder. Other than the free plan (for up to 2,000 followers), Benchmark gives you two other separate plans so that you can choose the one that’s best for your service. For instance, if you plan on sending only a few emails per month, one of the send based plans below is perfect for you. This plan is also perfect for if you have a shorter list that you’d like to send a lot of emails to. On the other hand, if you want to send unlimited emails to your list,a list-based plan is a better route to go. This way, you can adjust your plan based on your subscriptions instead of having to worry about the number of emails you’ll be sending out. High volume options are also available if you want to send large quantities of emails to large subscription lists at bulk prices. 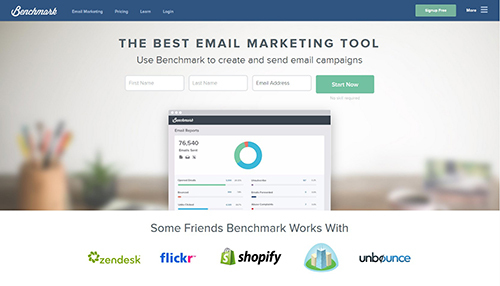 There are several reasons for why Benchmark is one of the best-known names in email marketing, one of them being its simplicity. With drag-and-drop building, you’ll be able to craft professional marketing campaigns without needing to hire a graphic designer. Speaking of saving you money, the company also offers a free plan for lists of 2,000 or less subscribers.With the many services and plans that Benchmark offers, it can grow with and adapt to your needs and your company, offering inexpensive and fully integrated marketing services for your business goals.